Link Up has partnered with WRVL / The Journey since 2007, when we were hired to build and support a Ku uplink at the campus of Liberty University. When the network decided it was time to retire their ABR platform, they turned to their long-time satellite provider and integrator to help them analyze their current needs and contemplate possible expansion plans. After considering Liberty’s needs, Link Up suggested – and WRVL accepted – the idea of upgrading to XDS from Pico Digital. For WRVL-FM, the benefits of of the new XDS platform were obvious. While the previously used Comstream single channel per carrier system allowed for only one stereo channel, the new XDS encoders allow a whopping four stereo inputs over multiple channels per carrier. Now Liberty University has the flexibility to offer more than one radio format to its listeners across the mid-Atlantic region. 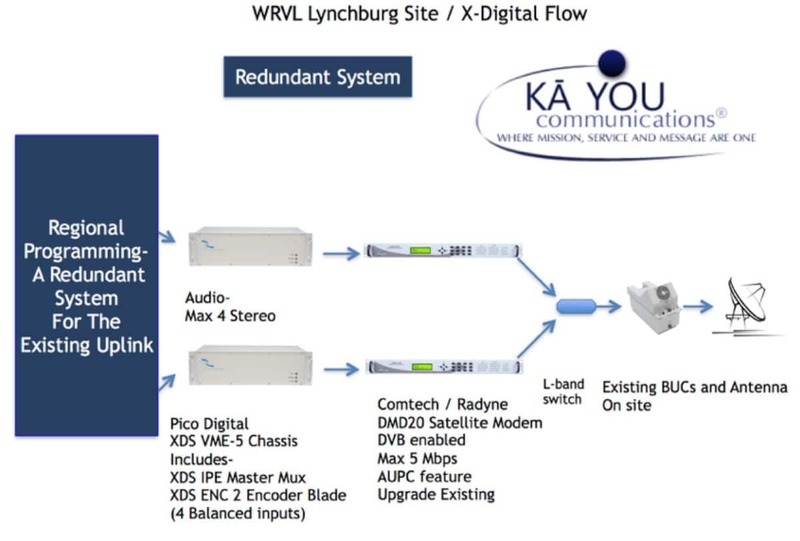 The XDS Pro1Q receivers used throughout WRVL’s network are tuned and programmed remotely. Engineering can use Telnet over IP or the receiver’s GUI to ensure that content is getting to all communities—no matter how far away. WRVL has made massive strides technologically and is now fully reliant on the next generation of satellite equipment. They are reaping the benefits of new, flexible satellite platform that actively provides solutions to restrictions of the past.